Wednesday, Oct. 24, 2018, 6:30 – 7:30 p.m.
Join University of Washington’s EarthLab for an evening with our 2018 Doug Walker Lecturer, Richard Louv. A journalist and the author of nine books, including “Last Child in the Woods: Saving Our Children from Nature-Deficit Disorder,” “The Nature Principle: Reconnecting with Nature in a Virtual World” and “Vitamin N: The Essential Guide to a Nature-Rich Life,” Louv will discuss the central role nature plays to human health and well-being at every age and stage of life. *Concessions available for purchase starting at 5:30 p.m. Doors to the lecture hall will open at 6 p.m.
Richard Louv sparked a conversation that led to an international movement to reconnect kids and nature. He coined the term “nature-deficit disorder,” influenced national policy, and inspired campaigns in more than 80 cities, states, and provinces throughout North America. His books have been translated into 13 languages, published in 17 countries and helped launch an international movement to connect children and their families to nature. 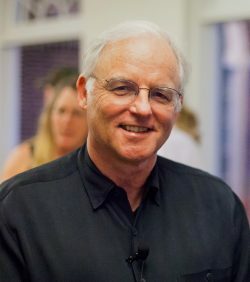 Louv is Co-Founder and Chairman Emeritus of the Children & Nature Network, an organization helping build the international movement to connect people and communities to the natural world. With artist Robert Bateman, he serves as honorary co-chair of Canada’s Child in Nature Alliance.